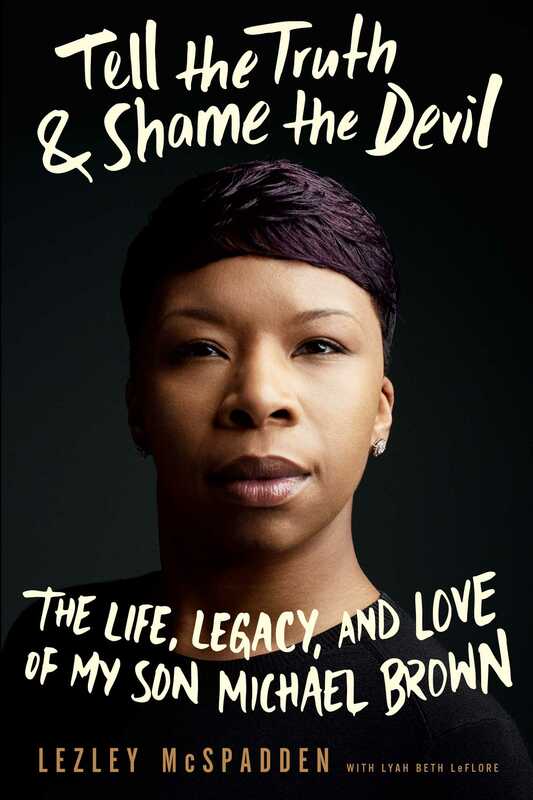 Chapter one takes us, the readers, immediately back to August 9th, 2014 with a vivid description of the moment Lezley McSpadden found out something terrible had happened to her son, Michael, affectionately known as Mike Mike. You can hear her voice. You can feel the pain in your soul but I suspect that parents who have lost children feel it on an even deeper level. A level that the rest of us can only imagine and hope to never have to experience for ourselves. What makes the whole thing sound and feel even more gut-wrenching, at least to me, as I read the words, is that it happens in the middle of an otherwise very ordinary day in the life of this mother of four. When a young man like Mike Brown is killed in these circumstances, the media and society as a whole rush to find all the reasons why he got what he deserved. It is like a competition at this point. Who can sully the victim’s memory the most and the fastest?… Just because of that, Lezley, as the protective and loving mother that she is, could have chosen to paint a much rosier picture of her son, his life, herself, and her own life. She didn’t even have to let us all in on the darkest times – some might argue that she is giving haters ammunition they don’t need – and yet, she did. She opened that door, not just halfway to allow us a quick peek at their lives but all the way. She invited us in for an emotional and raw sit-down. That’s probably what surprised me the most about this book: how candid and how honest Lezley McSpadden is about her own life, the good, the bad and the ugly. That and the unsanitized language. She doesn’t try to sell a fairy-tale story of a close-to-perfect family in which a close-to-perfect baby boy was born once upon a time and how that close-to-perfect baby boy grew up to be a close-to-perfect young man whose life was cut short by law enforcement. There is nothing perfect or close-to-perfect about Lezley’s life and that of her family, and she unapologetically lays all of her scars bare for all of us to see, maybe relate to and hopefully learn from. When tragedy strikes in this brutal manner, we often talk about closure and justice. But what does any of that mean for those who are left behind? Unless you can bring their loved ones back, is it ever possible to give them either justice or closure? I really don’t think it is. Not truly. Knowing the truth about what really happened that day could be seen as a form of closure because the truth can sometimes bring some solace and peace that unanswered questions make impossible to achieve. Three full years after losing her son, Lezley McSpadden still doesn’t know what occurred and likely never will. She has heard things from well-meaning people and other less well-intentioned folks since that day but the unadulterated truth is forever lost to us all and to her. A grand jury decided not to indict after hearing testimonies for weeks, dashing all hopes of a potential trial where more facts could have come out. The DOJ investigation concluded on a similar note. They investigated and reached conclusions. Isn’t that what justice is supposed to mean? Maybe in theory but when cases like the death of Mike Mike follow an all too familiar pattern and those who are involved in these matters, as supporters of the families, of the movement, and/or as activists, know all too well that justice is not for everybody and doesn’t work for everybody, can we really trust the process and believe in justice? It is clear in this book that Lezley McSpadden, although distrustful of the system, did her best to believe that eventually, if she kept her faith, some form of justice would be served and someone would be held accountable for the death of her beloved son. When it became obvious that neither would happen, she was understandably disappointed, sad and upset, but she had to decide how her life was going to go from that point on. Who was she going to be and how was she going to make Mike Mike proud and keep his name and legacy alive? Nobody would have blamed her had she decided to return to her anonymous life with her husband and children and all those who had been here since she came into this world, but the circumstances of her son’s death shun a spotlight on her and her grief, and it is that spotlight that she has decided to use for a mission bigger than herself, her son and her family. She started “Rainbow of Mothers” a coalition providing support to mothers who lost their children to gun violence because helping others had always been in her and she had an opportunity to bring something to these women that only someone who had been through what they had been through could bring. To take the fight even further, she later founded the “Michael O.D. Brown We Love Our Sons & Daughters Foundation”, which focuses on advocating for justice, improving health, advancing education and strengthening the family. What this book isn’t is an analysis of the final moments of Mike Brown’s life and the deadly encounter with officer Darren Woodson of Ferguson PD, a few blocks from Mike’s grandmother’s apartment. What this book is, however, is a love story between a mother and the son she had when she was only 16 and who became her whole world. It is the eighteen years of a young man life, that tragically ended with his body lying on the hot concrete street for four and half hours “like he belonged to nobody”, as witnesses have described. It is the coming of age of a young girl, who had to drop out of high school before graduating due to an early pregnancy and the life she made for herself and her baby boy against all odds, amidst abusive episodes with some of the men in her life, but with the support of the women who raised her and those she was raised with. It is also the aftermath of the loss of such a young life, filled with promises, hopes and dreams, the questions left unanswered and the new purpose it birthed into a mother who lost her very first love. Lezley McSpadden may have lost her eldest son, her Mike Mike, but she is making sure his name is never forgotten while working tirelessly to make the world a better place for children like hers -Déja, Andre and Jazmine – and the families and communities they come from. About the author: Lezley McSpadden is the mother of Michael Brown, and founder of The Michael O. D. Brown We Love Our Sons & Daughters Foundation. The organization advocates for justice, improving health, advancing education, and strengthening families. McSpadden also founded its signature program, Rainbow of Mothers, which was established to support mothers who have suffered the devastating loss of a child. She lives in St. Louis, MO with her family. About the co-author: Lyah Beth LeFlore is the author of eight books, including the novels Last Night a DJ Saved My Life and Wildflowers; the teen book series The Come Up; the New York Times bestseller I Got Your Back, and NAACP Image Award–winning The Strawberry Letter. LeFlore is also a television and film producer who has been profiled in the New York Times, Essence, Ebony, and Entertainment Weekly.